Dig for your life but watch out for magma pockets and subterranean beasties. 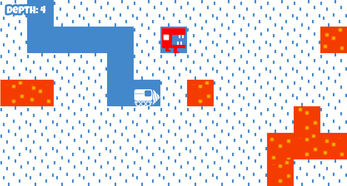 This game sketch was made in about 10 hours for the Ludum Dare 29 game jam on April 26, 2014. The theme was "Beneath the Surface." No time to work on it Sunday so I had to finish early. My favorite things about this game are the text animations and the way the magma flows into adjacent tiles. The world is 1000 tiles deep. The difficulty increases the deeper you go (more monsters and magma).